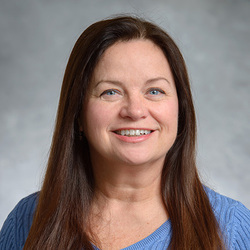 Dr. Russo states, “Being an instructor at the Aultman College of Nursing and Health Sciences is very special to me because I started my education in health care at the Aultman School of Nursing back in the 1970’s”. She left school before graduating to focus on raising her family. While raising her six children she spent many years teaching exercise classes at the YMCA. This reignited her interest in studying the human body. When her children were all in school she decided to start taking classes again. Now, she happily finds herself “back home” at Aultman College, but on the other side of the desk! Dr. Russo states, “I was proud to be a student here in the 70’s and I am just as proud to be a part of Aultman College today”. Her professional achievements include: 2012 Students Choice-Top Tutor at Stark State College, 2012-2013 Adjunct Excellence in Teaching Award at Stark State College, 2013 Person of Character at Stark State College, and the 2012-2013 Outstanding Adjunct Teacher Award Nominee from Ohio Association of Two-Year Colleges. Having the experience of being a non-traditional student has helped her relate to many of the students she has in the classroom. Dr. Russo states, “I know what it is like to juggle kids, work, home-life and classes”. The student’s time is very valuable and she works hard to make the most of it. It is very important to her to instill a solid understanding of anatomy and physiology in students that they may establish a strong foundation for many other health care courses. When not practicing Chiropractic or teaching, she likesto spend time with her children, grandchildren and friends.